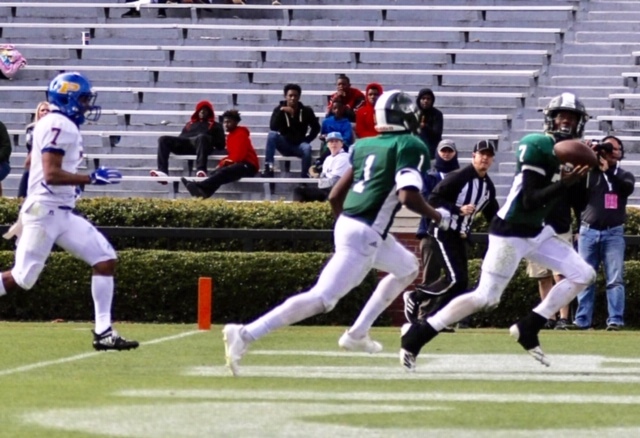 AUBURN – Someone asked Flomaton quarterback Daquan Johnson if he was tired. He had every right to be, though. 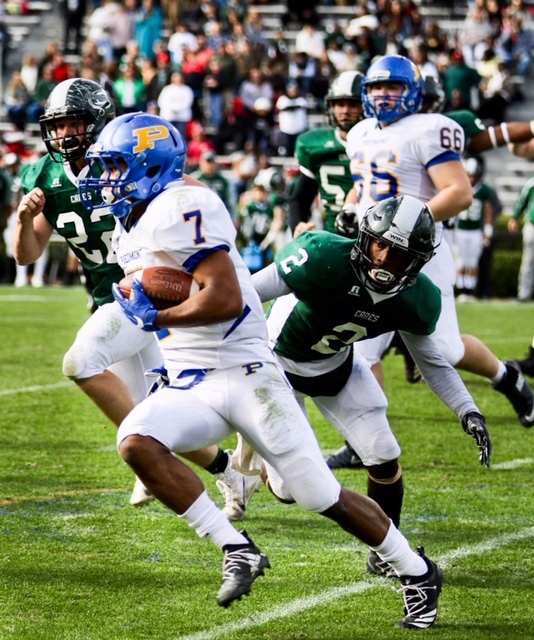 The junior did just about everything for his team in Thursday’s Class 3A state title game and it was more than Piedmont could contain. Johnson was most of the Hurricanes’ offense and a lot of their defense as they defeated the Bulldogs 23-12 to win their first state title – and spoil the Bulldogs’ bid for a third in four years – at Jordan-Hare Stadium. Johnson had 43 carries for 100 yards rushing and completed 6 of 13 passes for 166 yards. He ran for two touchdowns and threw for another. The Hurricanes (12-3) ran 68 plays as a team, so Johnson had all but a dozen – but as quarterback he touched the ball on every one, and handled both punts. Piedmont (12-3) had 43 total offensive plays. On the other side of the ball he was the Hurricanes’ leading tackler, intercepted a Mason Mohon pass in the end zone that effectively ended Piedmont’s last best threat of the game and, fittingly, made the last tackle of the game. Piedmont coach Steve Smith had seen something like this before. The effort reminded him of what Taylor Hayes gave his team in this very stadium during the Bulldogs’ 2016 state title game win over Mobile Christian. 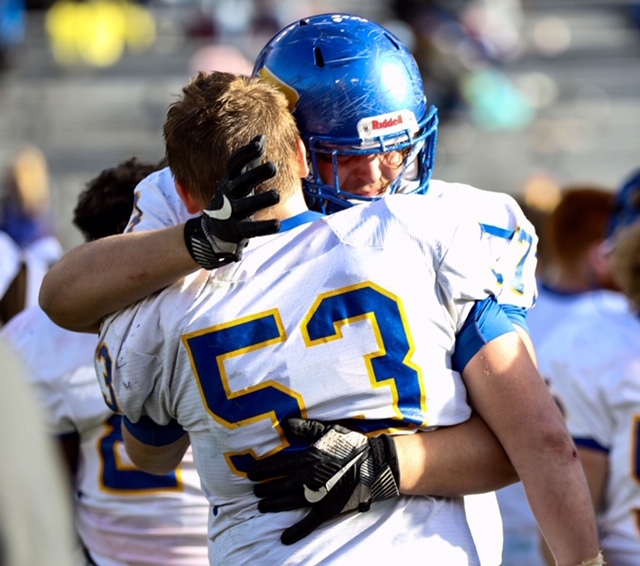 If Piedmont was going to win its third state title in four years, it was going to have to do it with its ninth come-from-behind victory of the season. The Bulldogs were held to 69 yards of net offense in the first half and trailed 9-6 at the break. Their defense kept it that close by holding Flomaton to five net yards on seven plays inside the 10, including a field goal to open the scoring and a nifty interception and return by Matthew Thornton on a gimmick pass Quincie McCall threw while in the grasp of Kaedon Jenkins. But the Bulldogs got a huge play at the start of the second half when Jenkins burst out of the locker room and went 75 yards on the first play to give Piedmont a 12-9 lead and big change in momentum. The Bulldogs did make two defensive stops with the lead, but the next four times they had the ball ended with two punts and two special team fumbles. They had six of the 10 total turnovers in the game. In the middle of all that, Johnson scored his first touchdown to give the Hurricanes the lead for good. This was a Piedmont team that defied projections to even get here. Not many gave the Bulldogs a chance to go far, but they proved a lot of people wrong by winning their region and making it all the way to the state finals. This senior class – from the time they were freshmen – played in 59 of a possible 60 career games, one semifinal loss from playing in four straight state championship finals. Actually, the Bulldogs weren’t on the field much in the first half. They ran only four plays (and a punt) on their two possessions in the first quarter and had the ball for just a shade over nine minutes in the half. Flomaton scored first on a 25-yard field goal by Adarius Odom with 1:03 left in the first quarter. But the Bulldogs took their only lead of the half 6-3 on a 3-yard Mohon run; the extra point was blocked. The Bulldogs got the ball when Thornton returned his interception from inside the 5 to across midfield. Flomaton went back ahead when Johnson tossed a screen pass to Sam Smith that went for 14 yards 1:33 before halftime. The Hurricanes set up the score on a 53-yard Johnson pass into the red zone. Johnson threw for 159 yards in the first half and had 19 of the team’s 22 rushing attempts. 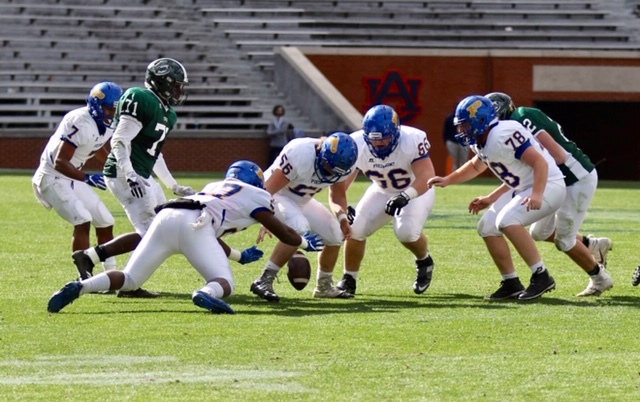 Smith “wasn’t a big fan” of instant replay when the initiative was introduced to Alabama high school football this year, but he threw the red challenge flag twice in the first half. One of his challenges was upheld.